The Respiratory Therapy Department provides Therapeutic Management and patient education for adult patients, specializing in Ventilator Weaning. Grace Hospital success rates for ventilator Weaning are greater than 70%. Therapeutic Services: aerosol therapy, airway care, assistance during cardiopulmonary resuscitation, bronchial hygiene, initiating, supporting and weaning from BIPAP, CPAP and ventilator support, incentive spirometry, medical gas therapy and intermittent positive pressure breathing treatments. Diagnostic Services: arterial blood gas analysis, bedside spirometry, pulse oximetry, intubation and support during bronchoscopies. Educational Services: discharge planning, patient education regarding aerosol therapy, asthma and COPD, oxygen and equipment use, staff education regarding oxygen use, competency assessment of nursing, physical and speech therapy and radiology on specific therapeutic and diagnostic respiratory procedures that they perform or may be exposed to while treating the patient. The Respiratory Therapy Department creates and implements policies, procedures and protocols that are based on American Association for Respiratory Care (AARC) Clinical Practice Guidelines, American Thoracic Society (ATS) and AMERICAN College of Chest Physicians (ACP) Standards and are adapted for use with our patients using a team approach as to the appropriateness, clinical necessity and timeliness of therapy. Clinical nutrition services provides nutrition assessment to all patients admitted to Grace Hospital. The scope and complexity of the patient care needs depends upon the patient's clinical history, medical condition, and nutritional status upon admission to the hospital as well as the methods of feeding to sustain optimal nutritional status. This may include oral, parenteral, transitional or enteral feeding. Patient care needs are assessed using a multi disciplinary team approach including participation in interdisciplinary weekly team meetings, discharge planning, and rounds with the primary care physician. Evaluation of patient care needs are established according to team consensus and appropriateness of therapies such as speech, occupational, physical and recreational therapy. Clinical nutrition services are provided by a licensed, registered dietitian. It is expected that the registered, licensed dietitian follow the Standards of Practice and Code of Ethics set forth by the American Dietetic Association and Commission of Dietetic Registration. An in-depth nutritional assessment is used to further evaluate the nutritional status of the patient after the initial nutrition screening parameters are evaluated by the dietitian. The amount, type and route of nutrition support is initiated as deemed appropriate by the dietitian and physician. Monitoring of clinical status, pertinent laboratory data, and tolerance to feeding, follow-up, reassessment are provided daily and weekly, biweekly according to the patients identified nutrition risk. Patient/family education are also provided as needed. Patients with complex medical needs may require interdisciplinary care that can become confusing not only to the patient, but to the family. Grace Hospital has experienced Social Workers/Case Managers that can offer assistance in working through financial questions related to health care. Our Social Workers/Case Managers can provide supportive counseling and or link you to services in the community. Social Workers/Case Managers also will invite the patient and family members to attend and participate in an Interdisciplinary Team meeting where everyone involved in the patient’s care can establish mutual goals. Discharge planning is an important part of care and Social Workers/Case Managers will assist you in this process beginning early in the patient’s stay. The goal of Grace Hospital's Rehabilitation Services to provide patients with low tolerance rehabilitation, with pain-free functional independence through physical, occupational and speech therapies and through patient/family education. Our patients receiving Rehabilitation Services present with impairments of self-care, communication, cognition, swallowing, pain, or may be coping with a chronic illness. Patients are evaluated by the appropriate licensed Rehabilitation staff and receive therapy on their own unit. Family members may observe treatment and are encouraged to discuss patient progress with the Therapists. Potential patients are assessed and evaluated while still in the referring institution regarding appropriateness for multi-disciplinary intervention in a long term acute setting. Assessments are performed by licensed registered nurses. An on-site assessment is performed by registered nursing staff. A complete chart review is done and a patient interview is conducted as that time. Information regarding services is provided to the patient and family (if present). Patients and family members are encouraged to ask questions at this time. 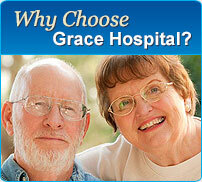 Family members are strongly encouraged to tour Grace Hospital units and interact with the multi-disciplinary staff. Patient admission planning is performed in conjunction with the patient, patient's family and/or significant others once the determination has been made that continued acute hospitalization is required. Diagnosis should consist of that which requires long-term acute hospitalization, eg. ventilator weaning, multiple medical issues/co-morbidities which require daily physician intervention. The anticipated length of stay is approximately 30 days. Grace Hospital’s nursing staff is committed to providing safe quality care to the acute chronically ill adult patient. Nursing care is individualized utilizing the full range of clinical skills and treatments available to enable patients to achieve their maximum level of wellness. New concepts are constantly adapted into the nursing process, services, and clinical activities. Care is delivered using a Team approach. The Registered Nurse (RN) cares for the patient from admission through discharge. Other Team members include Licensed Practical Nurses (LPN) and Patient Care Associates. Registered Nurses are experienced and competent in many critical care skills. They are Advanced Cardiac Life Support certified. An important measure of success for the Grace Hospital Nursing Staff is keeping the patient and family informed.